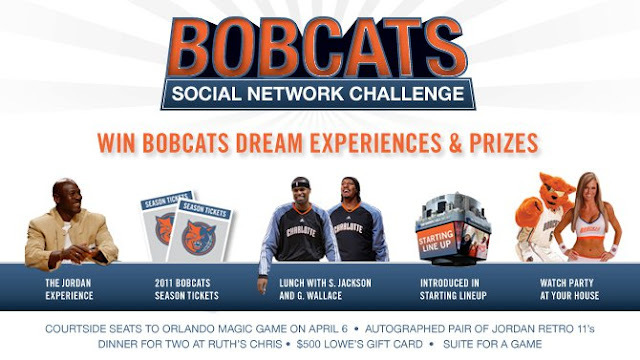 The Charlotte Bobcats have become quite the purveyors of social media. From their Bobcats Break blog, to their use of Facebook and Twitter, the team is connecting with fans on the 'net (and beyond the net...pun intended). The latest effort is their Social Network Challenge. Fans can sign up through a Facebook app to compete in an online ticket sales contest to win prizes. You sell the most tickets and you could win one of these: season tickets for the 2011-2012 season, lunch with team captains Gerald Wallace and Steven Jackson, a live introduction on court during a game with the Bobcats starting line-up, a custom-made Bobcats watch party at your house with the Lady Cats, a Bobcats suite, dinner at Ruth's Chris Steakhouse, an autographed pair of Jordan Retro 11s, courtside seats; and the grand prize is an opportunity to meet Bobcats Chairman Michael Jordan and get two courtside seat tickets. Here's how the contest works. After you register, you'll be given an exclusive link and passcode to sell tickets at a reduced rate for all the remaining regular season Bobcats games to your friends and family. You'll want to share your link and passcode on your social networks and/or via email and try to sell as many tickets as you can. The top-10 sellers get to choose one of the 10 prizes, with the top overall seller winning the chance to meet Jordan, which includes hanging out with him before a game and then you and your guest having a seat courtside. Prize selection is based on order of finish. And as motivation along the way, the first 50 entrants to sell 15 or more tickets will get two tickets to see the Bobcats play the Lakers on February 14. You need to register by January 23, and the Bobcats organizers will send out links and passcodes soon after. You'll then have until March 21 to sell tickets and compete to win. Click here to register.